I have been having speed issues most evenings so I decided to call bt who said their is a problem on the network and they will inform openreach who will give me a call within 48hours. Without knowing the exchange and service you are on so people can compare with others results impossible to say. If there is backhaul congestion it is nothing to do with Openreach, if this is Infinity they a very minute chance that one of the Gigabit links from a cabinet to an exchange is getting busy but almost unheard of. BT Retail has had a number of issues in its network of late, and thus it may be that, and switching to a provider that does not use that network may help. TalkTalk and BT are two very different providers. How are you testing, wired or wireless? Do you have speedtests to hand? 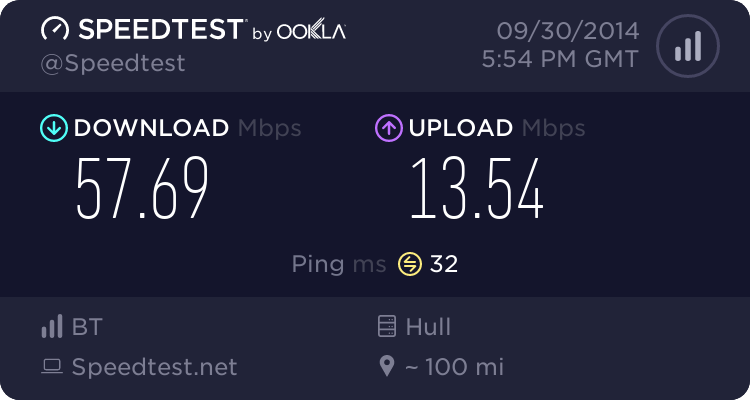 Please can you run the speedtest in the right-hand menu on thinkbroadband Main Site. It is best if you sign up to the Main Site first - you can use the same details as here, or different - and log in of course. Then it gives you a more informative test result and also logs it to your account. The just below the result will be a link you can copy and paste to here. We can see what that tells us, and also compare it with the 2014 Ookla one in your sig. I would do one now while its ok and then another one when its bad. That way we can compare the two. Great . It does two different downstream tests and graphs them. The difference between the two graph shapes tells MrSaffron a lot.